Midway through Robert Thackston’s closing arguments in the recent hog nuisance trial, the attorney for Smithfield Foods displayed a photo of a movie poster for Pale Rider, a 1985 Western starring Clint Eastwood. In the film, a mysterious justice-seeking preacher played by Eastwood tries to protect a village from a greedy mining company that invades on horseback, shoots cattle, kills a family dog and chases donkeys. The strategy of implicating his client as money-grubbing marauders, wicked killers and donkey chasers is puzzling. But in the bizarre theatrics of a jury trial, Thackston’s method might work. In the courtroom, Thackston is not charismatic, eloquent or even likable. However, Smithfield is paying him a presumably handsome sum not to be any of those things. His job was to erode the credibility of every witness for the plaintiff. If that required splattering the courtroom with snark, viewing the facts at Dutch angles and posting photos of Clint Eastwood, so be it. This latest hog nuisance lawsuit is the fourth of more than 20 filed by neighbors of industrialized hog farms against Smithfield Foods, the world’s largest pork producer. Smithfield is the defendant in every lawsuit, but in the past the company has claimed that the litigation was harming small family farmers that it had contracted to grow its millions of hogs. Smithfield lost anyway, and the juries awarded the plaintiffs in those trials a total of more than a half-billion dollars in compensatory and punitive damages. 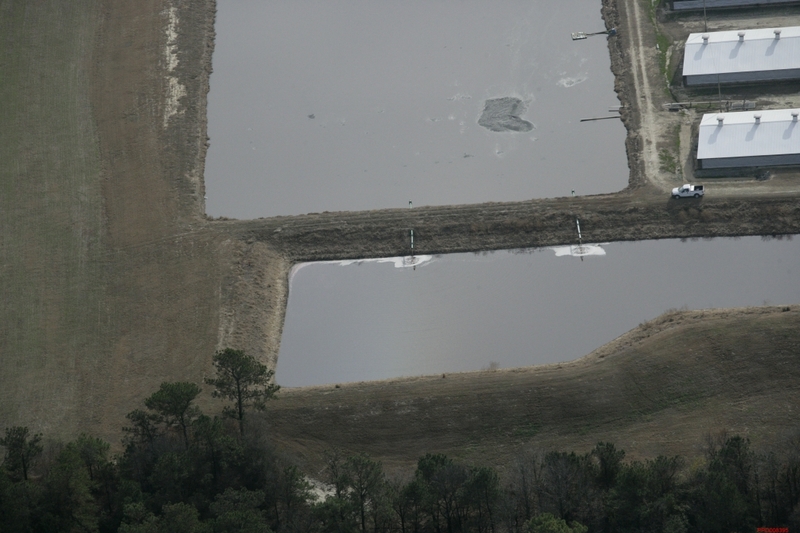 But in this case there is no family farmer because this is a corporate operation: Sholar Farms in Sampson County, home of 6,000-7,000 hogs and three open-pit lagoons, plus several acres of spray fields. The plaintiffs are eight Black neighbors, including a veteran of the first Iraq War, a hospice nurse, a family matriarch, and two sets of foster parents who live on Herring Road near its intersection with Moon Johnson Road. As in previous trials, they allege that the odor, flies, truck traffic, dead boxes (and the occasional dead hog in the road) substantially and unreasonably interfere with the use and enjoyment of their property. Many of the plaintiffs’ arguments were documented. Smithfield destroyed the samples taken from the Sholar Farm by scientist and environmental engineer Shane Rogers. Even though Smithfield claimed their operation was safe, the plaintiffs’ attorneys and Rogers had to delay their visit to the farm because of a widespread diarrhea outbreak among the hogs. The neighbors did complain to Smithfield about the odor, as documented in an email. Smithfield failed to follow up. Smithfield did make some improvements to the Sholar farm — in August, a few months before the trial began. It began using an “Aerway,” essentially a tractor that sprays the waste on the fields but much closer to the ground in order to keep the mist from traveling. The farm had used the Aerway briefly in 2010, then mothballed it until shortly before trial. However, the lagoons remain uncovered, and the sludge, which has not been removed for 21 years, continues to accumulate. “These improvements were just for show,” said plaintiffs’ attorney Michael Kaeske. In late October, Smithfield announced what it called a groundbreaking development for its hog operations. On 90 percent of its North Carolina farms, Smithfield would use hog waste and the resultant methane to generate biogas, which it could then sell. But this project will not reduce odor. It does not eliminate the primitive lagoon and spray field system. In fact, the system could require the construction of 1,300 more lagoons for the anaerobic digesters to fully operate. None of this will help the plaintiffs in this case, all of whom live on family land that has been handed down through generations. Two of the eight plaintiffs have lived there long before the hog operations arrived; Lottie Fowler, now in her 80s, lives 500 feet from where she was born, in a house owned by her great-grandmother. The other six inherited their land and chose to build homes there afterward in order to be close to their families. Thackston used the six to claim that they knew what they were getting into. But each of them denied knowing the full extent of the nauseating stench and the swarms of flies that drive them inside on otherwise lovely summer days. The odors apparently don’t bother the residents of a home near the Sholar Farm who have built an outdoor pool, Thackston said. “They did not bring you the person with the pool to testify,” plaintiff’s attorney Michael Kaeske pointed out during his rebuttal. There is only one Black person on the 10-member jury (two jurors left mid-trial because of illness or a pressing personal matter). Depending on their personal experience and history, the white jurors might not fully comprehend the significance of land ownership to Black people, especially in the rural South. Thackston also floated the questionable argument that state and county social services would not have placed foster children in the plaintiffs’ homes if the odors, flies and dead hogs were a problem. “They don’t put foster children in places that aren’t safe,” Thackston said. That is false. There is a shortage of stable, willing foster parents and social service workers for the 14,000 foster children in the state. In some cases, children are placed in very unsafe environments. For example, in 2013, a social services worker and a hospital nurse in Union County were arrested after one of their foster children was chained to a porch with a dead chicken around his neck. For the first time, we also learned that Rogers is intrigued by the possibility of ghosts and the paranormal. While this phenomenon is scientifically unproven, Thackston gambled on the possibility that none of the jurors have experienced paranormal experiences themselves. After Thackston finished his evisceration of the plaintiffs’ witnesses, Kaeske paused for a moment before launching into his rebuttal. At the end of The Pale Rider, there is a final shootout between the good guys and the bad guys. After the gunsmoke has cleared, Eastwood’s character walks to the edge of town and disappears, leaving only his hat on the ground. Just like a ghost.